Do you want to find ideal customers who will buy from you? You must first earn their trust. And before they can truly trust you, they must first know and like you. You’ve heard this before, but are you doing it? Start with story. This is how you get potential customers to understand you, like you, and maybe even buy from you. You do this by focusing on telling a story that speaks directly to them, providing a constant flow of valuable content written to help them. This story framework is a great way to help curious prospects like, know, and trust you, and become happy customers. To do it right you must follow three rules. Simple storytelling rules that will make it easier for people to discover you, start to like—maybe love you, have faith in you, and then decide you might be the person they hire or purchase a product from. You might be saying, Craig this is all great, but I’m no Hemingway, and have zero idea on how to get started. Well, that is why you’re reading this little post, right? 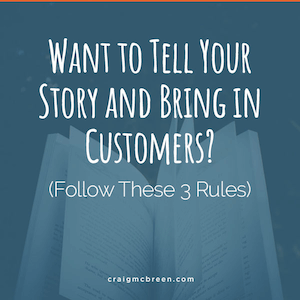 You want to learn how to write an ongoing narrative designed to help your ideal customer? Good thing, because this narrative is how you get them to like, know, and trust you. 1. Rule numero uno–Laser in on your ideal customer’s problems and write about them. Easy peasy, eh? Indeed, but here’s the thing–most business owners do not focus on this particular type of writing. They would rather write about their expertise, history, awards, etc., which is NOT the way to tell a marketing story that gets results. NOTE: You’ve read about this story thing and it probably makes you think about cable TV shows, books, and big time movies. But the thing is your brand story is nothing like a novel. You simply need to EDUCATE! First, brainstorm and focus on your ideal customer’s biggest issues. What is their pain? What problems do they face? And what, exactly, do they need from you? Now think about the top questions they would type into Google. Next, start writing out answers to the top questions. A Pulitzer Prize is probably not in your future. But who cares. You don’t have to be a great writer. All you have to do is write informative, engaging content that helps, and continue to do so on a consistent basis. It helps if you visualize one ideal customer who needs your help. This person is on a journey to get helpful information. You’re the guide. So, write as a guide and see what happens. What Are the 10 Rules of Focused Investing? Want to Invest? Know How Much Volatility Can You Tolerate? What Is the Best Way to Minimize Taxes with Asset Location? What Is a Life Coach, and How Can They Help? Etc. I think you get the picture. Effectively writing content to help people fix stuff will help you create a bond with them. This bond means you’re top of mind. It means they will like you. And it earns you the right to sell. Remember, their problems become the bedrock of your ongoing narrative. Your ongoing narrative can take the form of videos, blog posts, eBooks or all of the above. Just remember to teach, encourage, support. You’re an instructor extraordinaire showing them the way. Focus on the questions your customers always ask. Develop keyword titles focused on these questions, and your answers. The titles you come up with are your posts. After that, start writing out a theme for each month, then pick the best titles to fill each month. Month 11: Problems that arise and how to squash them. Month 12: Focusing on the big picture (planning for the years ahead). Get busy with that calendar! 3. Rule #3. Treat your ideal customer as the person in the lead role. The hero of their own movie. Remember. Each reader is on a journey. You’re here to guide them by crafting content designed to help them complete their journey. If you want them to like you, trust you, and tell others how great you are, start treating these people like the heroes they are. Practice a servant mentality and see where it gets you. Laser in on your reader’s problems and write about them, NOT your business. Don’t be a marketer. Be a teacher. Continually write content focused their pain. Be the customer and walk a mile in their shoes. Crank out content to guide them. Remember, you’re the expert. Proudly show your knowledge in the form of helpful content. Treat your readers like heroes. A familiar story framework you’re very familiar with. In the case of “The Karate Kid” it’s about our protagonist Daniel-san and his journey from zero to hero. Think about each potential customer as a young Daniel-san on a journey. Just remember that storytelling is not about you and your business. You’re simply the pro who shows them the way. Now get busy being their branding and marketing guide. Want to learn how to build your brand right the first time? Sign up for my email list and I’ll show you the 6 steps needed to bring your brand to life.